INSTRUCTIONS: Take the beer and gas line off of your existing Sanke tap. Remove the tailpieces you removed line from, and replace with the 1/4" MFL tailpieces from kit. 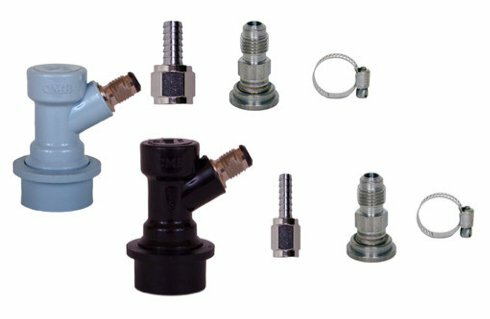 Put the 5/16" swivel nut on your gas line, and the 1/4" swivel nut on your beer line. Note: For 3/16" lines, dip the line into boiling water for 30 seconds, and it should slip on nicely. Lastly, tighten down with worm clamps. PERFECT FOR: Going between the Sanke Tap and homebrew disconnects by simply unscrewing the swivel nuts, and screwing back on the connection you need.